Not since “You And Tequila” has a hangover paid off so handsomely. In late 2012 Laura Veltz showed up to her writing appointment with Josh Osborne and apologized, “I got a little drunk last night.” They decided that was the perfect song idea and a hit was born. Veltz and Osborne made a “killer demo” of the tune, according to Veltz’s publisher BJ Hill from Warner/Chappell. Then Veltz took the demo to her manager, Mike Molinar at Big Machine Music. When his co-worker, BMLG A&R exec Allison Jones, heard the demo coming through the wall, she knew immediately it would be a great cut by the Eli Young Band. “Drunk Last Night” made its way to the top of the radio charts and is now Gold-certified. 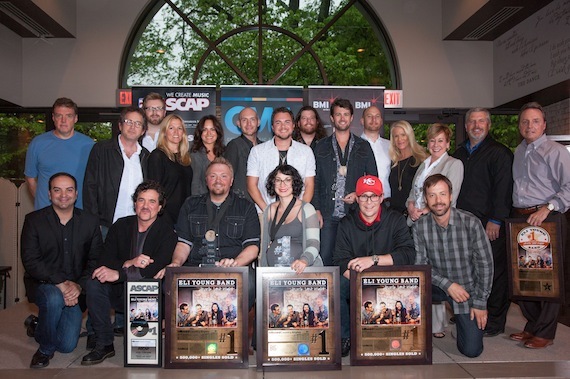 BMI, ASCAP, and Republic Nashville gathered at the CMA’s offices yesterday (April 28) to toast the team behind the hit. ASCAP’s LeAnn Phelan toasted Frank Liddell, who co-produced the track with Justin Niebank and EYB. “You are a treasure in this city,” she enthused, noting his work with ACM Lifting Lives, Nashville Screenwriters Conference, and his willingness to share credit with the engineers, songwriters and musicians who contribute to his projects. This is Liddell’s seventh No. 1. “You’re a hit songwriter, it’s in your DNA,” agreed Molinar. Osborne said it isn’t hard to let go of a song you wrote when it is going into the hands of the Eli Young Band and Republic Nashville, because they always work hard and put all they’ve got behind it. And in the very near future, Veltz will have two more reasons to celebrate—she’s pregnant with twins.